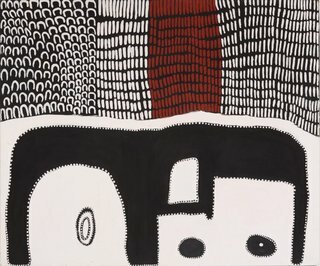 The Yiribana Gallery at the Art Gallery of NSW is the home of the Aboriginal and Torres Strait Islander art collection. It presents works from across the country in a diverse range of media and range of styles. The current selection is centred on family - whether this be family inheritance, family experiences or familial connections to country. In addition, numerous works by artists from within the same family are presented, highlighting both the connections and innovations across generations as works by parents and their children, or husbands and wives, are shown alongside on another. 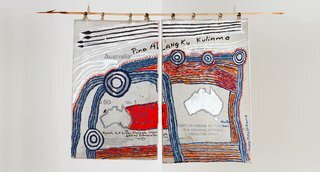 Pitjantjatjara artists Mumu Mike Williams, Willy Muntjantji Martin and Sammy Dodd have created an artwork that discusses land rights and law. Spears have an important symbolic role in law. Count how many spears you can see. Include both painted and carved spears. Design a protest poster to communicate an issue that is important to you. Locate the Anangu Pitjantjatjara Yankunyjtjatjara lands on a map. Find out about the important plants in this region. 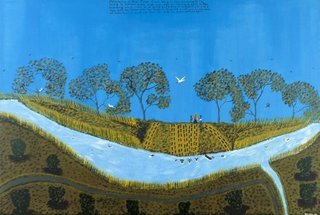 Ngarrindjeri artist Ian Abdulla combines pictures and words to represent childhood memories of life in the Riverland region of rural South Australia. Find the children cooking toast and swimming in the river. How many birds can you spot? Draw a map of you journey to school. Draw a cherished family memory. Write a short story explaining your drawing. Gumatj artist Gulumbu Yunupingu has covered this larrakitj (hollow log) in a field of stars. Look at the sculpture from different angles. What do you notice about the patterns on the surface? Imagine yourself as one of Yunupingu's stars in the night sky. Draw the planets, stars and floating objects you see around you. Photograph the stars in the night sky over two weeks. What has stayed the same and what has changed? Kudjla/Gangalu artist Daniel Boyd based this painting on a photograph that shows two figures seated on the ground, with one watching the other light a fire with a firestick. Look at the painting close up and far away. What differences do you notice? Draw yourself with a friend. Focus on showing light and shade. Find out about the use of firesticks in Australia. 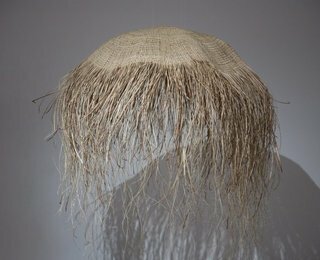 Warra Warra artist Susan Balbunga has used pandanus leaves to weave a bamugura (covering), which protects sleeping babies from milkmilk (mosquitoes) and gatjirri (sandflies). Look at the shadow cast by the bamugura. Imagine yourself lying underneath the bamugura looking up at the sky. Draw what you see. Use a torch to cast shadows of household objects against a wall. Notice the patterns and shapes created. Gija artist Lena Nyadbi paints stories associated with her country around Warmun (Turkey Creek) in Western Australia. Find the hideout of Binyjirrminy (the bat) depicted in this painting. Draw another animal that you might find taking shelter in a cave. Design and build your own hideout. Bidigal artist Esme Timbery learnt shell work as a young girl from her mother, grandmothers and aunts by first sorting the shells by type, size and colour. Notice the different types of shells on this sculpture. Talk about the shape, size and colour of each type. Draw a landscape where you might find shells. Include plants and animals you would find there too. Construct a model of your home using materials found inside and outside of your home.